It’s an obvious solution to trying to live in the season we are in. The past month I’ve spent most of my free time in the garden, either by trying to keep up with weeds or starting last minute seeds. I’ve been growing a lot of new plant varieties this year and observing how they grow in Zone 6b. In an effort to live in the moment, let’s try to keep the tasks on the shorter side this month in order to leave time to actually enjoy the garden as much as possible. 'Seaside' spinach growing in California. 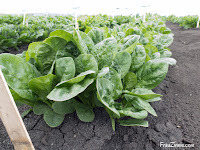 Think successive sowing for the leafy greens. For more cool-weather crops that can do double duty in the fall, check out these varieties I learned about in California last year. Or sow a cover crop — If you do not plan on sowing a fall crop, consider sowing cover crops to help condition the soil this fall and over the winter. More details here. Use weeds to ID missing soil nutrients. — A few years ago, I interviewed Diane St. John about organic lawn care. She shared how weeds can help you identify what nutrients your lawn needs, but I found myself thinking about how this applies to garden beds, too. For example, in a garden bed that is just a few years old, I am finding a lot of crabgrass popping up. I started to wonder what this meant, and checked the info Diane had shared. (Looks like I’m short on calcium.) While weeds can give you an idea of what’s wrong, it’s best to do a soil test to verify what your soil needs before you start adding nutrients on whim. Keep an eye out for caterpillars! — Monarch, black swallowtail and spicebush swallowtail butterflies should be laying eggs on host plants now. It's easy to get a bug box and bring them inside, where they will be safe from predators, including birds and wasps. I have successfully raised several generations of black swallowtail butterflies (which use fennel, dill and carrot as host plans), as well as two generations each of spicebush swallowtail caterpillars and monarch caterpillars. Monarchs are the trickiest to raise indoors, but don't let that scare you! The most important part is keeping their enclosures clean from frass and providing fresh food. 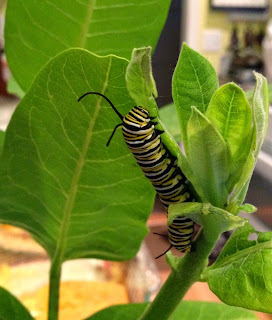 Last year I wrote more about my experiences raising monarch caterpillars (click here for more). To see how this year’s caterpillars are being raised, be sure to check my Instagram account where I share photos of the caterpillars as they grow. Water for birds. — During this hot month, make sure your birdbaths are clean and filled with fresh water. Birds need water, especially in areas that are experiencing drought conditions. Dump stagnant water so mosquitoes do not use it to breed. Iris care — Irises should be divided every three to five years, or when the clumps start to lack flowers. (There's a helpful article on dividing and transplanting rhizome iris here.) Irises like to have their roots exposed, and they seem to do well in drier portions of my garden where the rhizome won't be at risk for rotting, In addition, start trimming back irises to the "stubs" (except for rebloomers) which can prevent iris borers from ruining plants. This is not only a fall chore that you are getting a jump on, but it removes the site where the iris borer moth wants to lay its eggs, which will feed on the rhizome and kill the plant. Been there, done that — unfortunately. Hydrangea Care — If your hydrangeas need pruning, now is the time to act so you won't be cutting off next year's buds. There is a short three-week window to do this in August; after that, the plants will put their energy into creating flower buds for next year. Read more on how to do so here. Maintenance — The garden usually needs help this month with water, so keep an eye on plants. The best time to water is in the morning. Also, be sure to deadhead flowers regularly to keep plants looking their best. Pests — Keep shaking Japanese beetles into cups of soapy water to get rid of them. The best time to do this is in the morning or early evening hours, when they are not as active. Have you applied neem oil to your perennial hibiscus? This helps prevent the hibiscus sawfly from eating the leaves. Bulbs — Now is the time to figure out where you want to plant bulbs for spring blooms. Look at your garden photos from this past spring (really, how was that only four months ago!) to see where you need pops of color. Remember to get outside and enjoy the flowers! Summer is fleeting — onward!